This is what Hollywood does best. A timeless story told with big emotions and big drama. Bradley Cooper's new version of A Star is Born is everything I hoped it would be. It is, without question, one of the very best movies of the year. The original 1937 version starred Janet Gaynor and Fredric March, and was previously remade in 1954 starring Judy Garland and James Mason, and again in 1976 with Barbra Streisand and Kris Kristofferson. The 2018 version has Lady Gaga and Bradley Cooper, who also directs. The story is that a star battling alcoholism meets a young ingenue and their romance develops as her star rises and his star fades. The version this one shares the most DNA with is '76 (though this one is much better), as it retains that movie's innovation of switching the setting to the music industry rather than the movie industry. It also directly lifts the scene from '76 where the female character puts makeup on the male character while in the bathtub. Something that immediately sets Cooper's interpretation apart from all the others is that this is the first time I cared more about the male character than the female character. The script makes Cooper's character, here an aging country singer named Jackson Maine, more sympathetic than the characters played by March, Mason, and Kristofferson. Cooper's performance, especially in the scenes that address his addiction, is probably the best work of his career. As for Lady Gaga, her acting is impressive. Scenes where her character, named Ally in this version, has to make decisions, especially early on in the film, are some of the best ones because you can see the impact of her decisions weighing on her. She also has an incredible voice, but this we already knew. The music in the film is all good, except for the song that's intentionally bad. I predict the soundtrack will be a big hit. But does Gaga have a song worthy of becoming as associated with her as "The Man that Got Away" and "Evergreen" are with Garland and Streisand? The closest she gets to that would be "I'll Never Love Again", which is really powerful in the context of the film, but perhaps a bit generic. 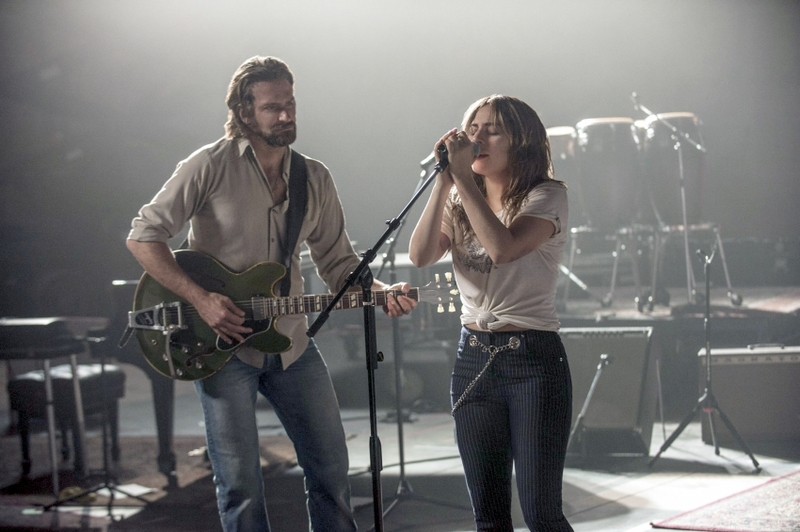 I suspect that "Shallow", a duet between Gaga and Cooper, will be the film's contender for the Best Original Song Oscar. As this is Cooper's first film as director, his directing ability was as much of question mark as Gaga's acting ability prior to this film. But he emerges as a major directorial talent, and an Oscar nomination for Best Director seems all but assured. The smartest decision Cooper made as director was hiring Matthew Libatique as cinematographer. Together they give the film a distinctive and artful visual style. The only negatives I can think of are that the movie is a little long, and the second half could be a tightened a bit. I have I feeling I'll be watching this movie many more times as I await Cooper's next directorial effort, Gaga's follow-up film role, and, yes, the next remake of A Star is Born. What did you think of A Star is Born? Let me know in the comments below! Thanks for reading!